Bernard won’t discuss where he will play football next at the World Cup. The 21-year-old Shakhtar Donetsk winger was linked with a move to Manchester City, even though he only joined the Ukrainian club for £22 million ($37.7 million) this season, according to Sky Sports. 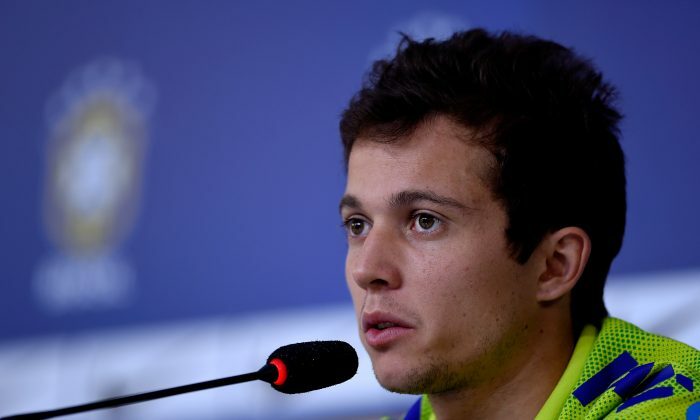 However, Bernard has refused to comment on his transfer future while at the World Cup. Bernard told Superesportes: “I made it clear since I arrived [to join the national team] that I won’t comment about the possibility of a transfer as I am focused on the World Cup. “It’s a unique moment in the career of a player, I want to mature and learn a lot here with my more experienced team-mates. “I leave my off the field situation to be handled by those who have the right to do so without me. “I don’t know [what will happen] after the World Cup, I have people to handle the off the field things,” he concluded. Tension will mount, no doubt, before the 5 p.m. kickoff (4 p.m. EDT/2000 GMT) in Tuesday’s World Cup semifinal match between five-time champion Brazil and three-time titlist Germany. Fans were already heading out to popular fan fests like those at Copacabana and in Sao Paulo, with most focused on the events that will unfold in Belo Horizonte in the evening. At the Mineirao Stadium, people wore Neymar masks to honor the 22-year-old star. Streets were filling with fans walking with Brazilian shirts and flags. Groups of Germany fans also could be seen around Belo Horizonte. Brazilians from all over the country were turning up early, soaking up the atmosphere and the beverages.